Coined by order of Alexander the Great! Pictured to the left at approximate actual size (about the size of a modern-day nickel). We have been consigned a hoard of 14 of these rare beauties, and we estimate that only a few hundred exist on the market today. Order these quality, problem-free museum pieces before prices start to reflect their true rarity. Each comes with a Historical Card and Guarantee of Authenticity from the Beverly Hills Coin Club. 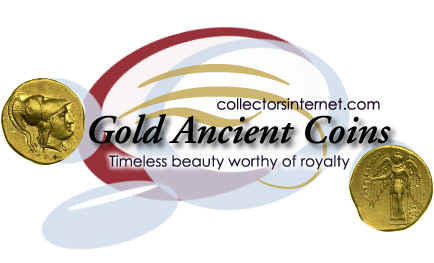 And as with all items we sell, a lifetime guarantee of genuineness from CollectorsInternet. All ancient coin dies (coin molds) were hand-made and each coin was hand-struck. Thus, no two coins are exactly alike. Kingdom of Macedon: Alexander III, the Great (336-323 B.C.) Obverse: Head of the goddess Athena wearing a crested Corinthian helmet ornamented with a serpent. Reverse: Nike, the winged goddess of Victory standing with a long crossed scepter and holding a wreath in her outstretched right hand. Greek legend: BASILEUS ALEXANDROU = "King Alexander"; monogram of the Babylon mint. The current coins offered are rare and a choice examples of Alexander's gold coinage, and have been certified genuine and thus guaranteed as such. Mean diameter: 18 mm. (0.71"). Weight: 8.58 gm. (.266 Troy oz.). Metal composition: Nearly pure gold. References: Ashmolean Museum Catalogue, #3029. Like most fierce leaders, Alexander the Great was not always the kindest person in the world. Nevertheless, he is considered by many expert historians of ancient culture to be the most efficient General of all time, having conquered most of then-known Western civilization. Ironic, since up until recently many military leaders barred homosexuals from being in the military, unaware that this triumphant General and many of his high command were, according to expert historians of ancient culture, homosexuals as well as highly skilled military men. Alexander the Great is still widely considered one of the few most famous and important persons who ever lived. Assuming the throne at the young age of 20 he set out on an historic expedition to conquer most of the known world. During his brief reign of 13 years he succeeded in defeating every empire that stood in his way. With great personal courage and brilliant military strategy he won victory after victory, and by his enlightened policy of generosity, tolerance and assimilation he turned enemy after enemy into an ally. By the time of his untimely death at age 33 he was master of an empire that reached from Greece to India and from Macedon and the Balkans to Egypt. Though his empire was quickly divided among his generals upon his death, he left an immense legacy in the mixing of Greek and Oriental cultures throughout the Hellenistic world, and he brought the Classical Greek World and the age of independent City States to an end. This ancient Greek gold coin was minted by Alexander during his reign, 336-323 BC, and other than the extremely rare disaster, is the highest value coin that he issued. Here is a rare opportunity to own a choice antiquity from ancient times and one that is directly associated with this historic personality.